In December 2013, Burlington Mayor Miro Weinberger approached a private donor with a proposal to improve and expand childcare offerings in Burlington. With some cash, his administration could "lay the strategic groundwork for a long-term city effort to improve early childhood education and ... make some immediate progress on the issue at a critical time," Weinberger wrote in an email obtained by Seven Days. Then and now, Burlington didn't have enough childcare opportunities to meet the demand. His pitch was persuasive enough to convince the anonymous philanthropist to fork over a $43,000 check to pay for consulting work by education advocate Jessica Nordhaus, who had served as Weinberger's 2012 campaign manager. Five years later, though, Weinberger's promise of "immediate progress" is sounding increasingly unrealistic. The city has so far invested $165,000 — raised from private donations — on consultants to study the issue. The only tangible results came last week, when officials offered Ohavi Zedek Full Circle Preschool a $14,000 grant to help finance four openings for infants. Weinberger admits his effort has fallen short. "If you'd asked me six years ago when we started down this, 'Six years in, is this what the goal is?' No, I wanted to be further along," he said in an interview last week. By all accounts, the "goal" Weinberger set wasn't — and still isn't — an easy one: to provide high-quality, affordable childcare for Burlington kids from infant through preschool. The Vermont Department for Children and Families regulates preschool and daycare programs, so it's unusual for a single city to get involved. But state subsidies for low-income kids haven't gone up since 2010. Centers large and small are feeling the squeeze. Slim profit margins lead to low wages, high staff turnover and insufficient opportunities for children in need. That's especially true in Burlington, where wait lists are years long. Childcare slots exist for fewer than half of the 1,110 Queen City kids under the age of 3, according to 2015 data compiled by Nordhaus. It's even worse for infants and toddlers from low-income families. Within months of being elected mayor in 2012, Weinberger recruited Nordhaus to research how the city could step in, according to 275 pages of city emails obtained by Seven Days. Nordhaus and Weinberger met while they both attended Yale University. She's worked as a public school teacher and served on the steering committee of Partnership for Change, an education-related nonprofit that works in Burlington and Winooski. In January 2014, the city awarded Nordhaus the $43,000 grant, and she spent nearly a year creating a "white paper." It proposed implementing a program whereby visiting nurses would make house calls in Burlington to new parents. It also recommended creating a scholarship program that would help low-income families whose state subsidies weren't enough to cover the full cost of childcare. The city would implement the scholarships by fall 2016 — and follow up with "rigorous evaluation" of its progress. Weinberger announced the plan at a February 2015 press conference, surrounded by state officials, including then-governor Peter Shumlin, and a host of early education advocates. He also announced the formation of a new, 35-member advisory board, along with a second planning grant for Nordhaus: a $122,000 check from the Permanent Fund for Vermont's Children, an early education consulting and advocacy nonprofit. The fund's CEO, Aly Richards, described Weinberger's effort as a "serious initiative" that showed the potential for progress on the municipal level. That appealed to her organization. Weinberger won a second term weeks after the press conference, and he highlighted the effort in his 2015 State of the City speech. "Our goal in launching a Burlington Early Learning Initiative is nothing short of ensuring that all Burlington children have the opportunity to lead full, healthy and successful lives," he said. For the next year, Nordhaus and the advisory board crafted another lengthy planning document, this one called the Early Learning Initiative Action Plan. The group fleshed out Nordhaus' original goals and added even more: commissioning a study of permitting and zoning rules to ease restrictions for childcare facilities, designating a staff member to oversee the program and creating a community-wide childcare wait list. None of the proposals ever got off the ground. The Visiting Nurse Association of Chittenden and Grand Isle Counties, which was intended to head up the home-visiting program, didn't have the resources, according to Nordhaus. Neither the scholarship program, nor the private money that was supposed to fund it, ever materialized. In January 2016, Weinberger wrote a letter to the advisory board, saying that the city needed to "take time to recalibrate." The city reserved $42,000 in community development block grants in fiscal year 2016 to use for the Burlington Early Learning Initiative. But when the initiative didn't move forward as planned, the money was reallocated to other projects, according to Weinberger. "I totally acknowledge to you that that whole effort turned out to be a dead end," the mayor said in an interview. For Weinberger, the effort is personal. His mom was a kindergarten teacher and his wife, Stacy, is director of early education at Burlington's King Street Center. His 4-year-old daughter, Ada, is enrolled in preschool at Stepping Stones Children's Center. Despite the setbacks, Richards defended Weinberger's work as "groundbreaking." "You're seeing ... what happens when you really engage with the community in this process," she added. "We're not sugarcoating in any of our work how tricky it is." A year and a half after the mayor called a time-out, he was ready to try again. Last May he announced the new and improved version of the Early Learning Initiative at a press conference with Vermont Education Secretary Rebecca Holcombe, city councilors and representatives from the University of Vermont Medical Center. This time, he had access to real cash — $500,000 from a fund for payment in lieu of taxes (PILOT), which collects money from local tax-exempt institutions such as UVM. The city would use the allocation to offer up to $50,000 apiece to daycare centers or preschools hoping to expand their openings. Specifically, they would be required to create new slots within 12 months. Again, the response was underwhelming. Just one childcare provider — Ohavi Zedek — submitted an application by the first grant deadline in January. The city extended it two more months, but the delay didn't attract any more interested parties. Ohavi Zedek will use the money to upgrade its bathroom to meet state regulations, allowing its program to accept four infants, some from low-income families, within a few months, according to director Grace Oedel. The Burlington City Council approved the $14,000 allocation on Monday. 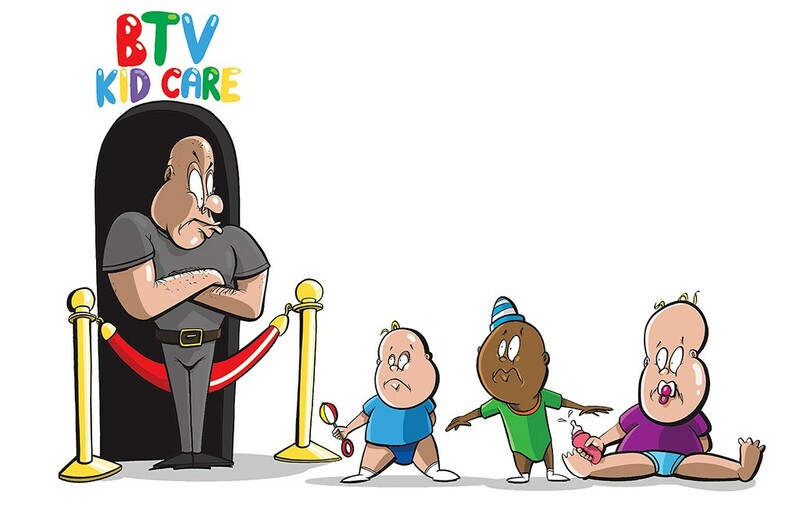 Why didn't more Burlington childcare centers take advantage of a $50,000 funding opportunity? "The way the grant is done shows the city has really missed the mark on what the early ed community needs right now," said Charles Winkleman, who worked as a preschool teacher for eight years at Burlington Children's Space and ran for city council as a Progressive in 2017 on a platform of universal, publicly funded early education. "A lot of people have been trying to tell the mayor that." One of those people was Leisa Pollander, executive director of the Sara Holbrook Community Center, which cares for 3- and 4-year-olds. Fourteen of her 15 charges are English language learners, Pollander said, and all are low-income. Pollander's North Avenue center is strapped for space and plans to expand by the end of the year. She said she would have applied for the $50,000 grant, but Sara Holbrook wouldn't be in a position to take more kids within the required 12-month time frame. She said she told the mayor's office "very clearly — I said, 'This doesn't help me,'" Pollander recalled. Administrators at the Greater Burlington YMCA and the King Street Center were also interested in the money but didn't meet the criteria. "That's not to say we don't have other needs," said King Street executive director Vicky Smith. For now, all that's been spent is $30,000 for Vermont Birth to Five, an initiative that operates under the Permanent Fund and administers the grants. The organization agreed to match the city money with in-kind donations of staff time. Didi Harris, strategic initiatives manager for Vermont Birth to Five, said they'd reevaluate the criteria and reissue the request for proposals by the end of March, lengthening the timeline in which funds can be used. Weinberger talked about his work on the Early Learning Initiative as recently as January 7, when he launched his third mayoral campaign and vowed to grow the program "so that all Burlington kids — including those born into poverty — have the opportunity to thrive." Still, nothing has changed for parents like Liz Casey, a Winooski resident who works as a teacher at Trinity Children's Center in Burlington. When she found out she was pregnant in April 2015, Casey put her name on the wait list of at least nine local providers, with an average nonrefundable deposit of about $35 apiece, she said. After she gave birth to her daughter in December 2015, she and her husband combined family leave and vacation time to care for their newborn. When a spot still hadn't opened up the following spring, Casey took more time off. When a slot became available at the last minute, she had to pay for three months of care — nearly $3,000 — that she didn't use because she'd already planned to take work leave. "It was frustrating," she said. "I was able to piece everything together — not everyone is." Max Tracy (P-Ward 2) noted poor "follow-through" on Weinberger's Early Learning Initiative. Dave Hartnett (D-North District) seconded, "I don't know if we've gotten the bang for a buck there." Weinberger said he expected to award the remaining PILOT money by the end of the fiscal year — in time for him to ask the council for another $500,000 for next year. "I can't tell you with 100 percent confidence that I'm going to see the day when we have a comprehensive new system," Weinberger said. "I'm hopeful as I've ever been that we can ... continue to make progress and grow this."